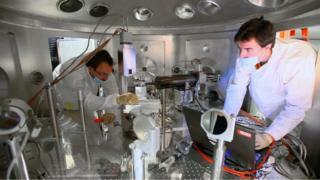 Researchers in Palo Alto in the US state of California have developed the most powerful X-ray laser in the world. The Linac Coherent Light Source is being used to see how atoms and molecules move in living systems. The machine is a billion times brighter than the previous generation of lasers. Prof Mike Dunne, who runs the Palo Alto facility, showed me around. He said the LCLS fired extremely fast bursts of X-rays. "Think about a person running the hundred metres," he told me. "The difference between first place and second place is sometimes 1/100th of a second. “Take that 1/100th of a second and divide it a million times. Then take one of those divisions and divide it another million times. And that's how fast this burst of X-rays is." The laser was developed at the SLAC National Accelerator Laboratory. Its systems were adapted from a particle collider. But instead of smashing atoms, it enables researchers to see what is going on in living systems and to track chemical reactions as they happen. "This genuinely is a revolution," said Prof Dunne. "We can now see for the first time deep inside an atom on the space scale and the time scale that chemistry and biology really happens. It transforms our ability to view the real world." Prof Dunne took me into one of the experimental areas, where the beam hits a sample and lights it up. Researcher Dr Meng Liang was preparing a dish of the material found in the brains of people who have Parkinson's disease. She believes that the new laser has the potential to transform investigation in her field of study. "To actually image these things in real time with the brightness and the fastness that LCLS has will be really special, so we can film them and see them instead of just looking at evidence for these kind of things," she said. In another chamber, Prof Anders Nilsson has for the first time seen how atoms behave in a chemical reaction. He said that the work would help chemists speed up and increase the efficiency of chemical production. "I think this is a chemist's dream. We can actually start to understand the processes and from that understanding develop new catalysts," he said.